Winter constellations are the constellations that are best observed in the evening night sky from late December to late March in the northern hemisphere and from late June to late September in the southern hemisphere. The most prominent northern winter constellations are Auriga, Canis Major, Canis Minor, Carina, Eridanus, Gemini, Monoceros, Orion and Taurus. Southern winter constellations are the same as northern summer constellations. There are two major asterisms dominating the winter night sky: the Winter Triangle and the Winter Hexagon. The bright stars Sirius in Canis Major and Procyon in Canis Minor are part of both. 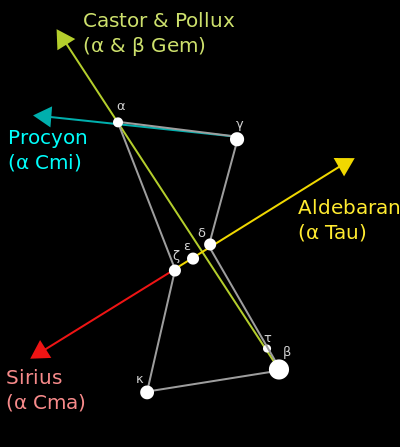 The Winter Triangle is formed by these two stars with Betelgeuse in Orion, and the Winter Hexagon is formed by a total of seven stars: Sirius, Procyon, Castor and Pollux in Gemini, Capella in Auriga, Aldebaran in Taurus and Rigel in Orion. The constellation Orion itself contains several prominent asterisms: the hourglass-shaped asterism representing the body of the Hunter, the famous Orion’s Belt and Orion’s Sword. 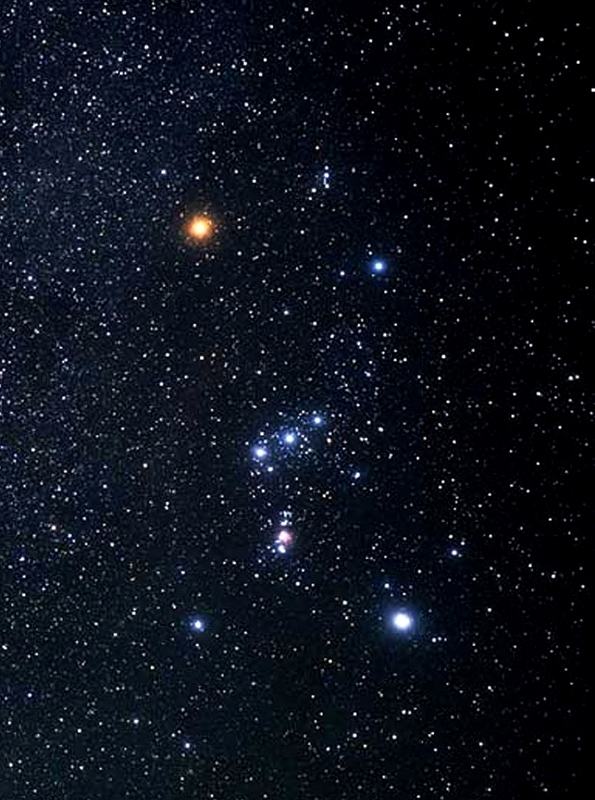 The constellation’s brightest stars, Rigel and Betelgeuse, are among the ten brightest stars in the sky. They are both supergiants and among the most distant first magnitude stars. Two of the stars that form Orion’s Belt – Alnilam and Alnitak – are also supergiants, while the third star, Mintaka, is a multiple star system whose main component consists of a bright O-class giant, a B-class main sequence star and a B-class subgiant. The three stars of Orion’s Belt all belong to the Orion OB1b association, which means that they were created in the same molecular cloud and share a common motion. As a result, the shape of the asterism has not changed since ancient times. Orion’s Belt can be used to find other bright stars in the vicinity. Following the line formed by the three stars to the east, one can find Sirius, the brightest star in the sky. 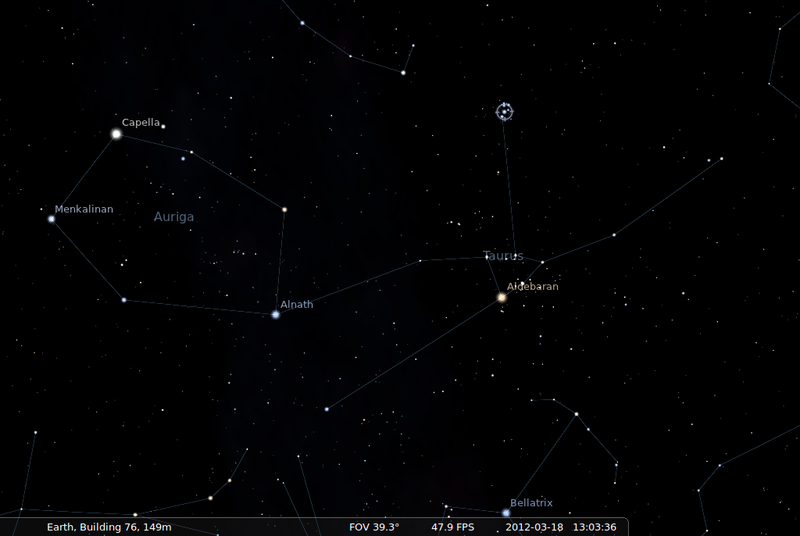 Going in the opposite direction, the stars point toward Aldebaran, the brightest star in the constellation Taurus. Orion’s Sword, depicted as hanging from Orion’s Belt, is formed by a line of three stars, the middle of which only appears as a star to the naked eye, but is in fact one of the brightest, best known and most photographed nebulae in the sky. The Orion Nebula (Messier 42), the nearest massive star forming region to the solar system, is visible to the naked eye despite lying at a distance of 1,344 light years from Earth. It is home to the Trapezium Cluster, a bright cluster of young stars located in the nebula’s center. The Orion Nebula is part of the Orion Molecular Cloud Complex, an enormous star forming region that contains a number of notable deep sky objects, including the Flame Nebula, the Horsehead Nebula, De Mairan’s Nebula (Messier 43), and Messier 78, the brightest diffuse reflection nebula in the sky. Taurus is one of the oldest constellations in the sky and it contains a number of notable stars and deep sky objects. The constellation’s brightest star, Aldebaran, is the 13th brightest star in the sky. The orange giant has a mean apparent magnitude of 0.85 and lies at a distance of 65.1 light years from Earth. Taurus is also home to the Pleiades (Messier 45) and the Hyades, two of the nearest open star clusters to Earth, and to the famous Crab Nebula (Messier 1), the bright remnant of a historic supernova observed in 1054. Auriga constellation, the celestial Charioteer, hosts Capella, the sixth brightest star in the sky, and three bright open clusters catalogued by Charles Messier: Messier 36, Messier 37 and Messier 38. The constellation is easy to find in the sky because its brightest stars form a prominent pentagon shape. The constellations Canis Major and Canis Minor harbour two of the 10 brightest stars in the sky. Sirius, the Dog Star, is the single brightest of all stars. Located in Canis Major, only 8.6 light years from Earth, Sirius is also the fifth closest star system to our own. It is a binary star system composed of an A-class main sequence star and a D-type white dwarf. 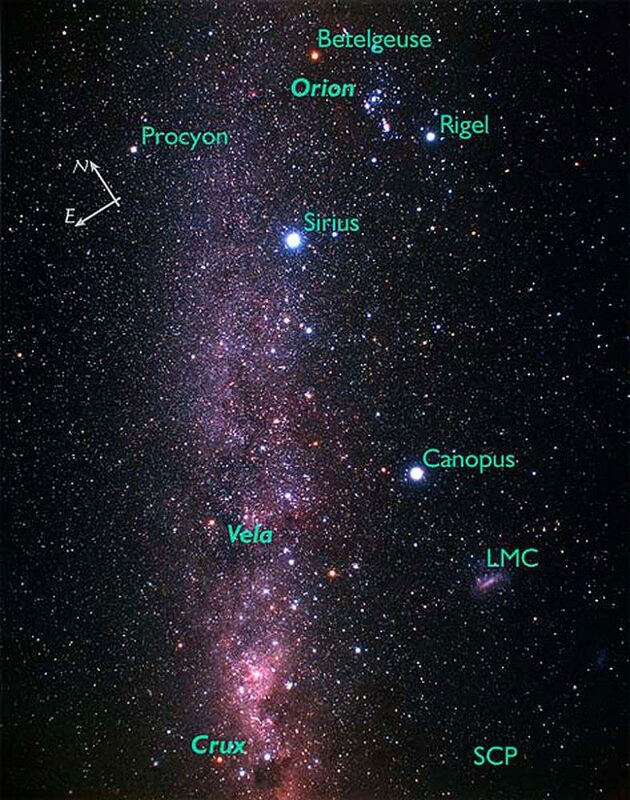 With a visual magnitude of -1.46, Sirius has almost twice the brightness of Canopus, the second brightest of all stars, located in the southern constellation Carina. The bright open cluster Messier 41, easy to observe in a small telescope, can be seen near Sirius. Procyon, the brightest star in Canis Minor, is the eighth brightest star in the sky. It has an apparent magnitude of 0.34 and is also a binary star system. It consists of an F-class white main sequence star and a dim white dwarf. The constellation Gemini can be found east of Taurus, between Procyon and the bright stars of Auriga. The constellation’s brightest stars, Pollux and Castor, appear similar to the naked eye, but are really quite different. The brighter Pollux has an apparent magnitude of 1.14 and is 34 light years distant. The star is an evolved orange giant, the nearest of its kind to the Sun. Castor is a multiple star system with a combined visual magnitude of 1.58, approximately 51 light years distant. The system is made of up of six stars formed into three pairs. Gemini constellation hosts several notable deep sky objects: the open cluster Messier 35, the Jellyfish Nebula, the Eskimo Nebula (Clown Face Nebula) and the Medusa Nebula. Situated between Canis Major and Canis Minor, Monoceros is a faint constellation that represents the celestial Unicorn. Its brightest stars are only fourth magnitude, which means that it is not easily seen with the naked eye in less than ideal conditions, but it contains several well-known stars and deep sky objects. These include the famous variable stars V838 Monocerotis, Plaskett’s Star, S Monocerotis and R Monocerotis, the bright open cluster Messier 50, the Rosette Nebula, the Cone Nebula, the Christmas Tree Cluster, and Hubble’s Variable Nebula, illuminated by R Monocerotis. Eridanus, the celestial river, is the sixth largest constellation and home to Achernar, the ninth brightest star in the sky. Located at the constellation’s southern tip, the star is a binary system approximately 139 light years distant from Earth. Epsilon Eridani, an orange main sequence star located only 10.5 light years from the Sun, is the third nearest star or star system that can be seen with the naked eye. Interesting objects in Eridanus include the Eridanus Supervoid, a large area, about a billion light years in diameter, completely devoid of galaxies, the barred spiral galaxy NGC 1300, Cleopatra’s Eye Nebula (NGC 1535), and the Witch Head Nebula (IC 2118). Carina, a southern constellation that cannot be seen from latitudes north of 20°N, harbours the second brightest star in the sky. Canopus has an apparent magnitude of -0.74 and lies at a distance of 310 light years from Earth. The bright giant is circumpolar for observers south of latitude 37°S. Eta Carinae is another famous star in the constellation. The star is really a binary system obscured by the Homunculus Nebula, a bipolar emission and reflection nebula embedded within the considerably larger Carina Nebula, a vast star forming region with an apparent magnitude of 1.00. Even though the Carina Nebula is about four times larger and considerably brighter than the Orion Nebula (mag. 4.0), it is not as well-known because of its location in the southern sky. Like the rest of the constellation, the nebula always stays below the horizon for most northern observers. At the turn of the 19th century, the binary star system Eta Carinae was faint and undistinguished. In the first decades of the century, it became brighter and brighter, until, by April 1843, it was the second brightest star in the sky, outshone only by Sirius (which is almost a thousand times closer to Earth). In the years that followed, it gradually dimmed again and by the 20th century was totally invisible to the naked eye. The star has continued to vary in brightness ever since, and while it is once again visible to the naked eye on a dark night, it has never again come close to its peak of 1843. The larger of the two stars in the Eta Carinae system is a huge and unstable star that is nearing the end of its life, and the event that the 19th century astronomers observed was a stellar near-death experience. Scientists call these outbursts supernova impostor events, because they appear similar to supernovae but stop just short of destroying their star. Although 19th century astronomers did not have telescopes powerful enough to see the 1843 outburst in detail, its effects can be studied today. The huge clouds of matter thrown out a century and a half ago, known as the Homunculus Nebula, have been a regular target for Hubble since its launch in 1990. This image, taken with the Advanced Camera for Surveys High Resolution Channel is the most detailed yet, and shows how the material from the star was not thrown out in a uniform manner, but forms a huge dumbbell shape. 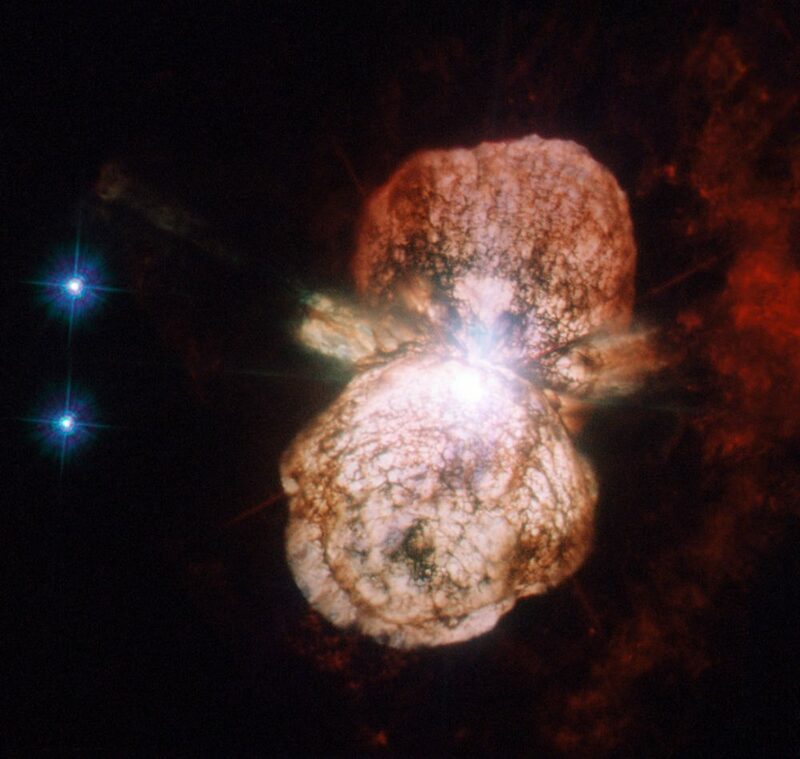 Eta Carinae is not only interesting because of its past, but also because of its future. It is one of the closest stars to Earth that is likely to explode in a supernova in the relatively near future (though in astronomical timescales the “near future” could still be a million years away). When it does, expect an impressive view from Earth, far brighter still than its last outburst: SN 2006gy, the brightest supernova ever observed, came from a star of the same type. Carina also hosts the False Cross asterism, a diamond-shaped asterism often confused for the brighter and smaller Southern Cross in Crux, as well as the Southern Pleiades (Theta Carinae Cluster), the Wishing Well Cluster, and the Diamond Cluster. The Bullet Cluster, a galaxy cluster consisting of two colliding clusters of galaxies and named for the shock wave observed in the intracluster medium, is also located the constellation. Observations of the collision of the two clusters, which will eventually merge into one, are claimed to provide the best evidence to date for the existence of dark matter.